On Stage Lighting takes a look at the curse of the Lighting Designer and some reasons why it can be more of a danger than ever. But you can resist it’s temptations, and we’ll set on you on the road to recovery. Read on. Technology has the potential to fill our life as lighting designers, as a market for entertainment industry equipment has sprung up and grown rapidly in the last 30 years. At first glance, this seems like we have been give the keys to the sweet shop, all that possibility, the shiny things, the brightly coloured sugary lighting treats. RGB + White, natch. As the cost of manufacturing technology has dropped, the sweet shop has been open to smaller budgets, not just a few professional shows. The fact that there is a perpetual debate about buying moving lights for schools is testament to fact that technology that once was cutting edge is now available to all. Who needs stage lighting technology? A lighting designer’s role is to work with other key players, the Director, Scenic Designer et al, to create a stage picture or environment that enhances a production beyond that which could be achieved by just leaving the cleaning lights on. That might involve cutting edge technology. But it doesn’t have to. There is not rule a written somewhere at ALD headquarters that says “The Lighting Designer shall wrangle all the available technology into submission and mould it to fit the production”. Nothing is bigger than the show and the audience’s experience. Nothing. Not you, not the cast, not 20 of the latest nodding buckets that the local hire company has just invested in. Nothing. Lighting Equipment – Ally or Curse? By others. Having equipment that you don’t need, the show doesn’t need, but that someone somewhere has decided you must use in order to justify their budget. This is more of a professional industry problem and usually stems from the fact that, as a lighting designer, you may be engaged by a lighting hire and production services provider. It’s just life, deal with it. Do your job to the best of your ability and move on to the next show. But you can avoid the second form. The second form of the equipment burden is self inflicted and I suspect at some stage in our careers, we’ve all fallen prey to it. It’s particularly obvious when a novice lighting designer at a school or college is given a bigger show, bigger budget, and bigger expectations than they are used to. Ok, so assuming that the small matter of a bunch of extra infrastructure is gonna be required to control and power just one of yer hired in MaryLite Chunky Boys is not an issue, you might still have a problem. Time and again, what happens in this situation is that a “saturation rig” plan is produced, the local hire companies shelves are emptied and the limits of the school gym snow loading are tested for the very first time. But the real limitations I’m afraid, are expertise and by extension, time. Every space between shiny hire kit was filled with your trusty generic fixtures, leaving endless possibilities – apart from the fact that you didn’t really get a chance to focus a lot of it, in the end. A 1K fresnel hangs there, impotently, obviously pointing nowhere in particular, a barndoor half closed. The show happens. Shows always happen. They happen if you are tired or not, ready or not. You busk together some looks, just something, using all that kit, somehow. Maybe you might even get a few slaps on the back for your efforts. But you know, it could’ve been so much better – better if you’d had more time, if those stupid twonks hadn’t rigged half the main truss back to front, better if you were more comfortable with the Grand MA…. The truth is, it would have been better if you’d had less equipment. The burden of equipment has sucked the life from you and your creativity. Cash has been spent at the expense of time to do anything meaningful with the result. Every piece of kit on a show needs time. Time to set it up, to make it work, time to focus to use it properly in your lighting armoury. The more kit you have, the less time every piece of kit gets from you and your team. This is true, even if you are completely au fait with every technical aspect, can perform miracles on the console and have a team of super professionals around you. If the above scenario hasn’t happened to you yet, I’d love to think that reading this article could stop it from doing so. But it probably won’t. The burden of equipment is something we all have to go through as lighting designers, to emerge the other side with a better understanding of what is important on a show by show basis. You can mitigate the equipment burden by your own approach to planning lighting for a production. Doing something as simple as steering clear of CAD or equipment inventories until you have a full understanding of the needs of a show can be a start. Make yourself. Decide on not looking at a venue plan or a kit list for a specific time period – a week, or two. Use this time to really consider the elements of the show, scenes or whatever, and set them against what you know of the Director’s vision or the audiences need. And remember the list of whose interests really lie in your sweet tooth. We want more sweets, the manufacturers make ’em, we push production standards and possibilities…. All in all, the whole situation is “a good thing”, don’t get me wrong. After all, without technology in lighting, we have very little to work with. But don’t think for a moment that it comes without side effects. I saw a great example of a “too much gear” show recently – Leonard Cohen tour. Grid full of moving heads, floor full of LED washes on the backcloth, GrandMA console. End result – some nice presets, rich saturated washes. But… it also had some really ugly colours on the backcloth in the fades between presets. They only really used 6 colours on the backdrop (except by mistake!) And most of the movers never moved. No gobos at all, no subtle colour fades, no dynamic effects of any kind (except for a cheesy scrolling effect across the backdrop in the encore). Stage lighting is such an art, that is why you can go to college to study it in theatre production. 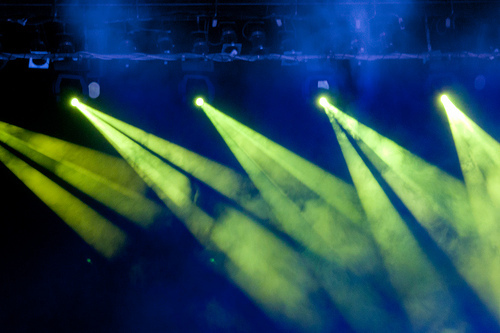 Stage lighting is used in so much more than theatre productions too as you pointed out and as an individual looking to make a job out of it, there are some great resources on the web to get the best stage lighting equipment available for you work. I blame TV shows for the over use of kit. Nobody is impressed with moving lights any more per se, but punters and producers continue to be impressed with sheer scale. Shock and awe! Luckily, its not a problem I have had personally lately. Good article about light technology. However, my beef is the sheer quantity of light on professional stages. There was a time when many 1 Kw & 0.5 Kw lanterns were used to light a show with perhaps a 2 Kw key light. Now, the lanterns are 1 Kw & 2 Kw with 5 Kw key lights. I went to a see a play in Basingstoke and needed sun glasses because it was so bright. When the interval came, the house lights were so dim it took several seconds to adjust my eyes and see properly. Clever moving lights and spot lights that automatically follow principal actors are fine – just turn the levels down! Always ask yourself, “Are you using it because you CAN? Or because you SHOULD?” My shows immediately improved. I use what’s needed, not what’s wanted or expected because it’s available for use, and my shows reflect a much higher degree of professionalism because of it. shows reflect a much higher degree of professionalism because of it.